What new technologies and talent management strategies can organizations use to empower the changing workforce? Learn from experts at the Oracle OpenWorld Asia to be held at Singapore from 26-27 March 2019. The world of work is changing dynamically-not only in structure but also in composition. As old business models of work get disrupted, what is also changing is the shape of the workforce. This mobile, diverse, curious, and global workforce demands newer approaches from organizations from everything to designing the jobs of tomorrow to engagement to planning for future growth. So as organizations focus on creating their tomorrows, human capital and talent management leaders also need to focus on how they can shape the future workforce, turning it into one of their biggest differentiators. What tools do they need to allow this agile group of employees to better compete in the digitally transformed future economy of tomorrow? What new technologies and talent management strategies can they use to identify critical skills, assess talent strengths, and empower this changing workforce? These are some of the questions which Oracle OpenWorld Asia to be held at Singapore from 26-27 March 2019 will aim to answer through a bevy of innovators, disruptors, and thought leaders at the conference. Oracle recently concluded Oracle OpenWorld Europe in London last week which touched upon pressing trends like why the technology sector needs more diversity and the rise of the connected worker. In line with this, one of the most critical tracks of the Singapore conference is the Changing Workforce track which will exclusively focus on the human capital and talent management aspect of the changing workforce. In this session, Oracle customers will share about their journey to the cloud. They will reflect on their experiences and learnings from their journeys, on their reasons for undertaking the move to the cloud, their experiences and key factors for successful change management, and what they would recommend to others still undertaking their journeys. In this interesting session by John Menhinick, Director of Product Management - Adaptive Intelligent Apps at Oracle, discover how the ability of AI to understand the behaviors of individuals enables you to deliver to employees the insights, functionality, and knowledge centered on their roles and needs, and automate recommendations as broad as learning and compliance, new roles and common workflow functionality. In this case study by Suzan Prayana - Regional Manager, HR Data & Efficiency, AXA, discover how AXA performed a major HR transformation while evolving its current global PeopleSoft HCM platform to the Oracle HCM Cloud over the last two years. Suzan will shed light upon the key milestones of the transformations and the lessons learned through this journey. In this session, hear about the newly announced integrations between LinkedIn and Oracle HCM Cloud and Taleo Enterprise Edition which enables HR teams to take a holistic view of their talent’s experience, skills and career aspirations in order to grow their talent pool, improve the candidate experience and enhance internal mobility. The session is a must to learn how it will benefit the HR and recruiting professionals. “Digital Assistants”, based on Machine Learning are now directly embedded within core applications. In this session, know how this technology will support faster and more robust decision making, and positively change the role of management and its associated skills. With gig economy and a multi-generational workforce coming into full swing, the connected worker will shape the future of employee experience. This demo session will enable delegates to experience how the connected worker will re-include HR “in the flow of work” and ultimately making work more human. This session will throw light on the benefits of a diverse workforce. Diversity not only provides social harmony at work for the employees but also increases productivity and profitability that will help the organization to succeed in the global marketplace. Know more what organizations can do to develop an equal opportunity employer mindset and enable such an ecosystem. Otto Beisheim School of Management partnered with Oracle set out to investigate what factors truly impact the agile organization. This session provides delegates the opportunity to hear the results first and get deep insights into these seven critical factors. Besides these sessions, other sessions in the HCM track will focus on HR in the age of disruptors, on how organizational agility is the most potent tool to fight business disruption and on how organizations can drive business values through innovative HR. 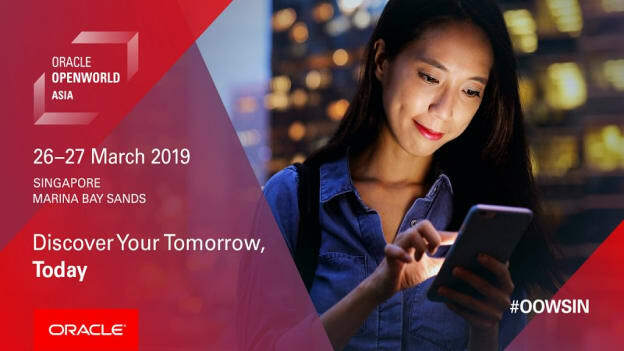 Click here to register for the Oracle OpenWorld Asia: Singapore happening at Marina Bay Sands, Singapore from 26-27 March 2019.